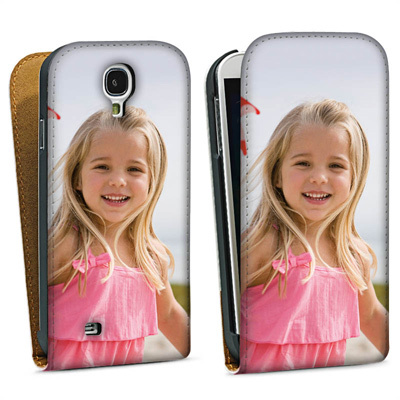 The Down-flip Case is a great choice for protecting your smartphone in style. The durable jacket with leather-look perfectly protects your screen from scratches. The cover flips over the screen and locks magnetically. Inside the jacket is a sturdy case that helps protect your phone from any damage caused by dropping or bumping the phone. Another fantastic thing about the Down-flip Case is that Pixum lets you print it front and back! It's hard to find another shop where they will give you this much freedom with your design. Thanks to our high-quality, professional printing process, your photo preserves all of its quality in any aspect on the flexible leather-look material, and the image is scratch-proof. Custom design - Rock & roll or subtle understatement? It's up to you! The Down-flip Case gives you plenty of room for all of your ideas, due to its design. By creating your custom Down-flip Case you not only spare yourself the effort of looking through endless amounts of unoriginal mobile covers, but you get to design a completely unique accessory.